Whenever you communicate with a dog, it's important to spot signs of aggression as early as possible and act according to the situation. This should help avoid unexpected injury and trauma. It is a mistake to think that if a dog has not bitten anyone, the problem is not serious. An aggressive dog can go beyond its warnings at any time. Early signs of aggression are usually easy to deal with. The older the dog gets, the more difficult it is to correct its behaviour. Early acknowledgement and correct reaction to aggressive behaviour in dogs can prevent many problems. Any of the following warnings mean the dog is in an aggressive state of mind. • Biting even if it does not break the skin. If your dog occasionally shows one or some of these signs, or if it has been one-time occurrence, you can most probably deal with the problem yourself by setting up rules and boundaries, obedience training, socializing your dog and using positive reinforcement techniques. 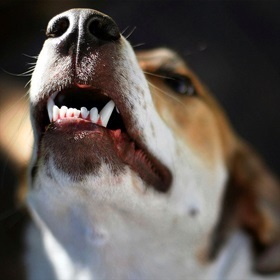 Before you start acting, it's important to determine whether your dog is showing dominant, territorial, fear, or food (prey, predatory) aggression. It should help you choose the best way of dealing with the problem. If you don't think you can deal with your dog's aggression yourself, or if you become seriously worried about your own and your family's safety, it's highly recommended that you get professional help.